Women in sport are unfortunately subjected to more scrutiny than men. With lower turn-out at games and less funding, it's an uphill battle for those who chose to participate. And for those talented enough to reach a professional level in any sport often experience more public abuse than most. We've all heard the common jabs - women's sport is boring and easier - and seen the belittling sexualised images of professional athletes in their kits, and we've all grown tired of it. 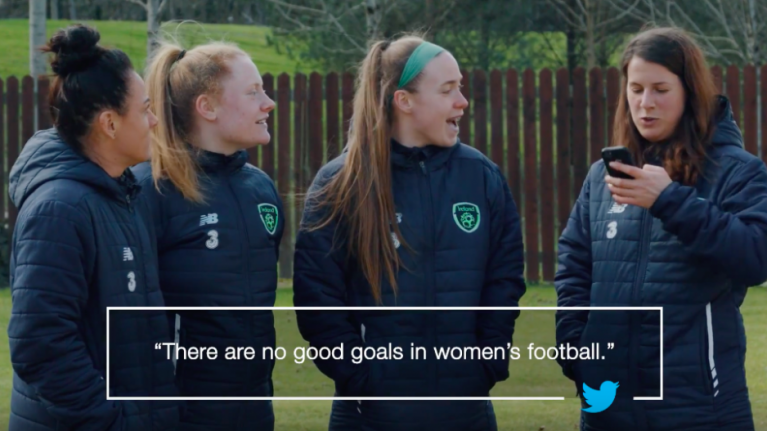 "There are no good goals in women's football"
Especially Ireland's National Soccer Team members Niamh Fahey, Sophie Perry, Amber Barrett and Claire O'Riordan who are calling out the ridiculous criticisms of their game and proving people wrong every time they step on the pitch. Taking time out from preparing for the upcoming World Cup qualifiers against Slovakia and a top of the table clash with the Netherlands, the internationals have come together to call out the haters in good humour and dismiss the negative sentiments surrounding women’s football. “Can you respond to brute ignorance?”, Amber Barrett asks.